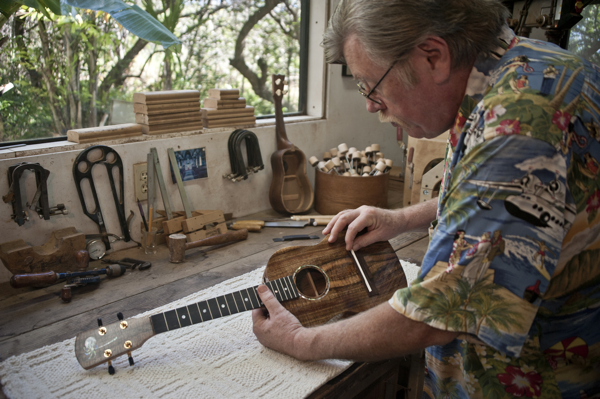 All instruments from the most traditional Pineapple to a very custom Jazz model are constructed in the same way, one at a time, with sound and playability being the primary concern. When I make an instrument for someone, I also keep in mind what they are looking for in the sound and what kind of music they will be playing. Before I start, I choose the bracing wood and neck wood that seems right. The bracing will be Sitka, Engelmann, or Adirondack Spruce, each with a slightly different character. The neck wood will be either Honduras Mahogany, or occasionally Spanish Cedar. The details of construction vary, as each instrument is an individual, but I believe all my work shares a certain kind of feel and a sound that is identifiable. I strive for a clear tone on all the strings, even at the higher frets, and with definite overtones and sustain. These are the prices for Custom `Ukulele, with all the standard included features mentioned in the Options section- your cost could be more or less depending on how you design your instrument. All models except Aunty Nona's Kapuailohia which does not vary, may be customized in the same fashion.